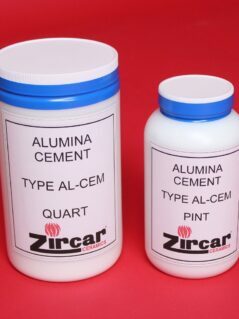 ZIRCAR Ceramics’ Alumina Cements Type AL-CEM are single-part water-based adhesives designed for bonding and or coating high temperature fibrous ceramic and other porous refractory materials. 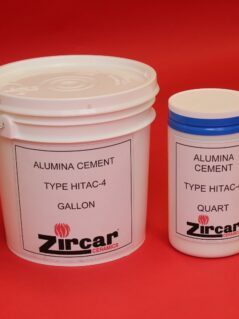 ZIRCAR Ceramics’ Alumina Cement Type HITAC-4 is a single-part water-based alumina adhesive specifically developed for its tenacious bond upon drying with further use in application temperatures as high as 1425°C (2597°F). 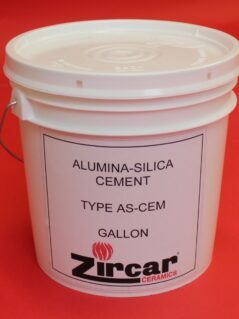 ZIRCAR Ceramics’ Alumina-Silica Cement Type AS-CEM is a single-part, water-based coating cement with useful properties to 1260°C (2300°F). 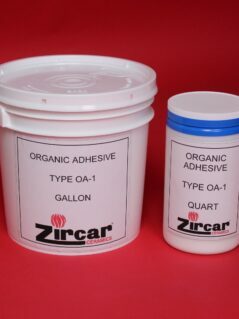 ZIRCAR Ceramics’ Organic Adhesive Type OA-1 is a soft, water-based polyvinyl acetate adhesive that is used primarily to bond ceramic fiber paper to castertips and in the fabrication of end dams used in the continuous casting of aluminum strip. 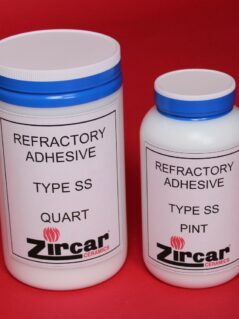 ZIRCAR Ceramics’ Refractory Adhesive Type SS is a “hard” adhesive with useful properties up to 1000°C (1832°F).